I realized today that I neglected to mention a suggested beta-adjustment for this trade. While normally I will make an downward adjustment relative to the amount of leverage employed on any ETPs that I trade (e.g.- a 300% leveraged ETP would call for roughly 1/3rd of a typical position size), as this is expected to be a relatively quick trade (days or weeks) with relatively modest gain (~13%) and loss (~3%) potential, the suggested beta-adjustment is 1.0 (a typical position size). 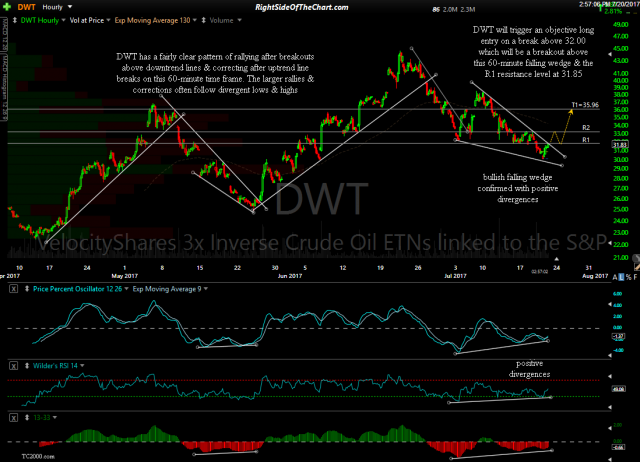 Randy I could not find this DWT ETF in Fiedelity Account. 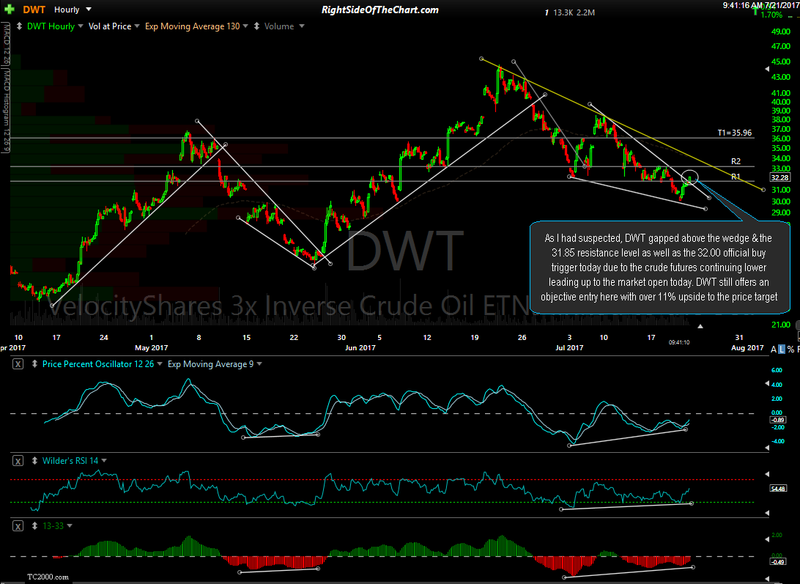 Watch out with DWTI, it might still be trading but on the OTC market. It’s very different from DWT. Although I went long in my trading account with Interactive Brokers, I have accounts at Fidelity & I was able to create an order ticket on DWT. You might have typed in the wrong symbol (DTW, etc..). The other issue might be that you never clicked to accept their terms & disclaimers for trading leveraged ETFs. If I recall correctly, I was prompted to do so a while back in order to be able to trade the leveraged ETF as they can be toxic to retail traders that aren’t aware of the decay & risks when holding those instruments for extended periods of time. Call them & they should be able to help you with that although I will also warn you about the potential pitfalls of using those 3x ETFs for anything other than quick trades.